This report illustrates preliminary building damage assessment overview, that provides percentages of buildings damaged per country / territory / island assessed by the different mapping groups (UNOSAT, Copernicus EMS, SERTIT and NGA) as of 21 September 2017. In response to the emergency caused by IRMA-17, UNITAR-UNOSAT, Copernicus EMS, SERTIT and NGA performed building damage assessment analyses using pre- and post-event satellite data. 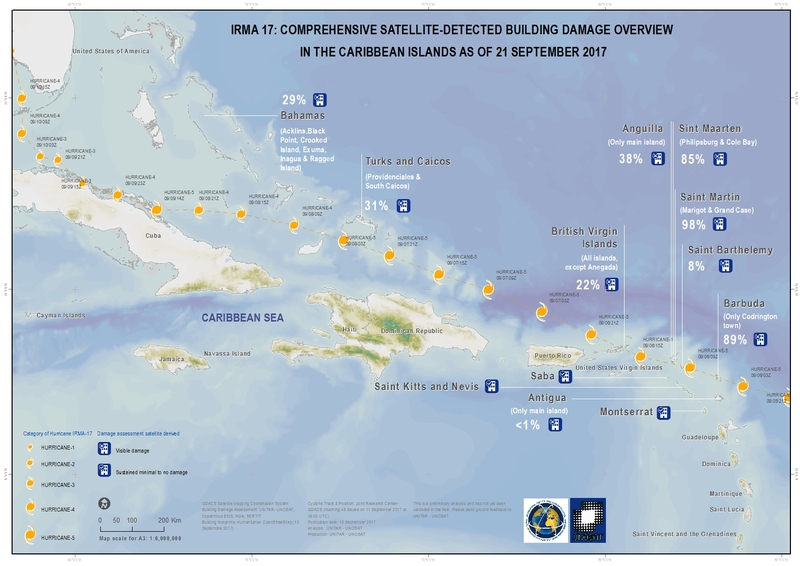 In the present document, UNITAR-UNOSAT compiles the main results of these analyses in one map in order to present a comprehensive building damage overview covering the most affected areas. The table below provides satellite detected damage statistics for different countries and territories analysed in the Caribbean. Figures are based upon analysis of satellite imagery acquired from the 7th to the 16th of September 2017, as well as pre baseline data from Humanitarian Open Street Map. It is important to note that building damage estimates are based exclusively on satellite imagery analysis and it has not been validated in the field.